These soft gingerbread cookies are easy to make, stay soft for days and are cute as can be! Guess What?! 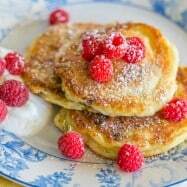 They don’t require any oil or butter – seriously!! 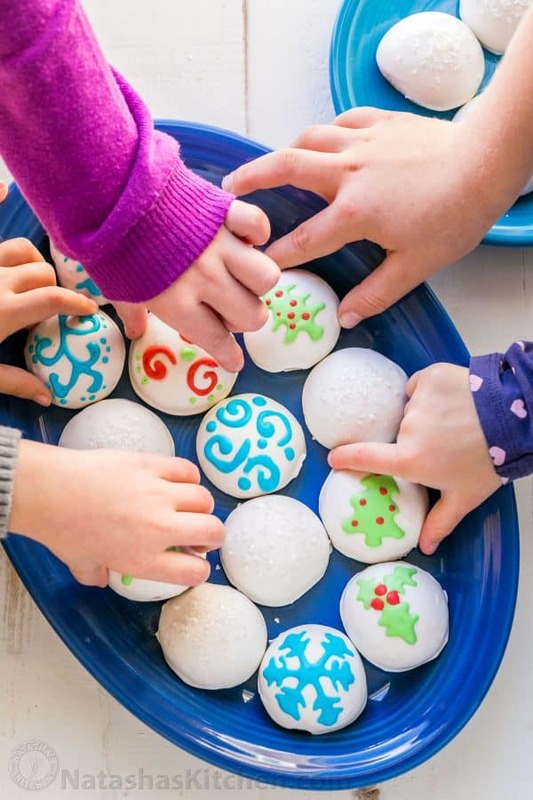 They have deep gingerbread flavor and the glaze makes a perfect canvas for decorating these beautiful Christmas cookies with sprinkles and pretty designs. You can easily change them up for any holiday really but there’s just something about gingerbread and Christmas that feels right :). 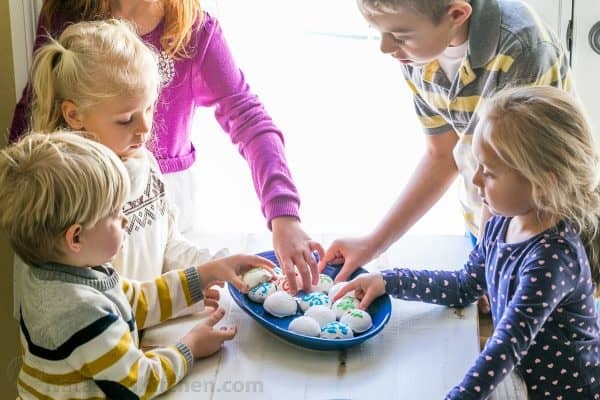 My nieces and nephews attacked these just as soon as I finished photographing and gave them the go-ahead (ha ha!! See the photo evidence below) and of course they gave rave reviews! 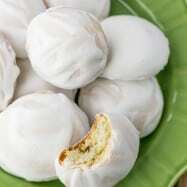 This is the Christmas adaptation of my Mom’s famous mint-glazed pryaniki that everyone in our family is crazy about. They are definitely worth discovering! 1/2 tsp vanilla extract – try our homemade recipe! Food coloring gels as desired. 1. 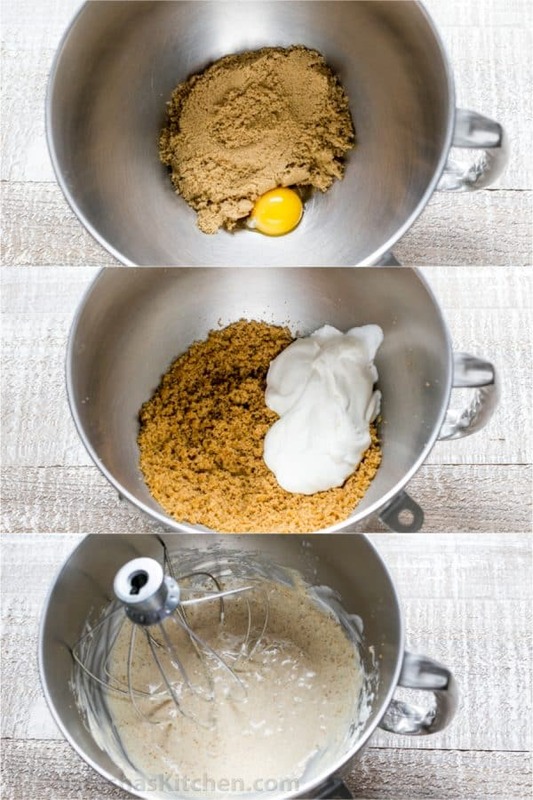 In a stand mixer, whisk together 1 egg yolk and 1 cup brown sugar until blended then whisk in 1 cup sour cream. 2. Put 1/2 tsp baking soda in a large spoon ramekin and stir in 1/2 tsp white vinegar. It will foam, then pour into the mixing bowl and stir into the batter. 3. Add 1/4 tsp salt, 1/2 tsp vanilla, 1 1/2 tsp ginger, 1 1/2 tsp cinnamon, and 1/4 tsp ground nutmeg, and whisk until well blended. Now using paddle attachment, add flour 1/2 cup at a time letting it incorporate before adding more. Dough will be very sticky. 4. 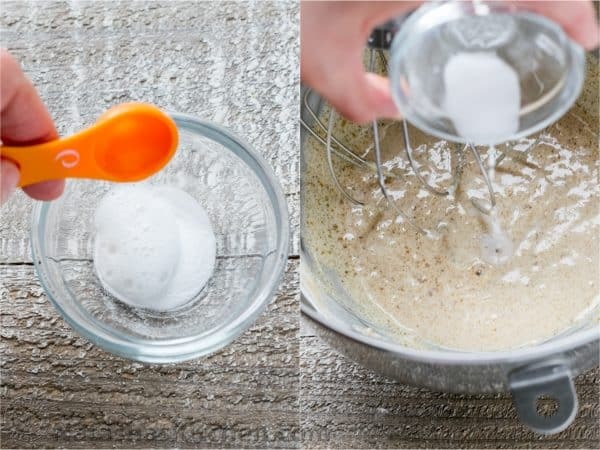 Scoop 1 heaping tsp dough into well-floured hands and roll into 1” balls. Space balls evenly on a silpat or parchment lined cookie sheet and bake at 350˚F for 20- 25 minutes (I baked for 22 min) or until barely beginning to golden. Remove immediately. 1. In the bowl of a stand mixer, beat egg whites on high speed with whisk attachment until foamy and tripled in volume (2-3 min). Reduce speed to low and add 2 cups powdered sugar and 1 tsp vanilla, mixing until well blended, scraping down the bowl as needed. Increase speed to medium and beat another 2 minutes or until creamy and smooth (do not over-beat). 1. 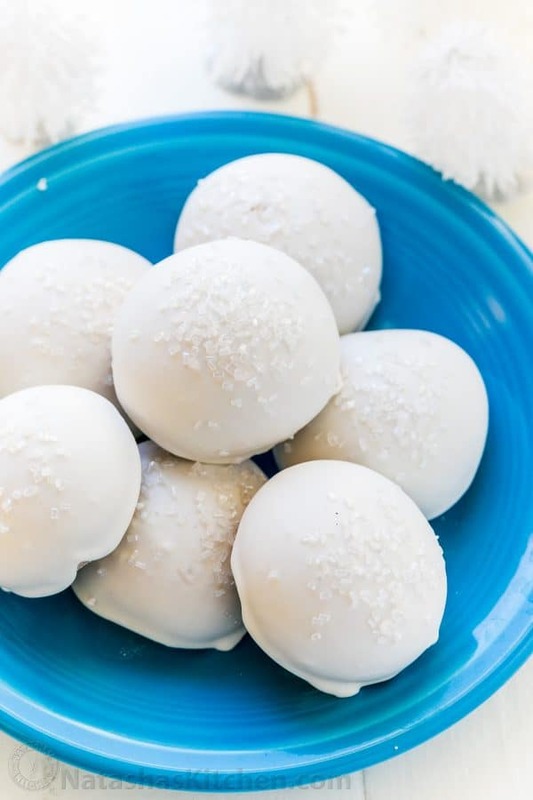 Once cookies are out of the oven, right away, dip each one in the vanilla glaze, coating only the top of the cookie then set on a wire rack and let rest until glaze is dry and firm. 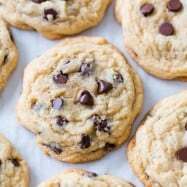 If you want to use crystal sugar or sprinkles, apply right after the cookies are glazed so the sprinkles stick to cookies. 2. If using color, divide remaining glaze between as many ramekins and you want different colors. I used green, red and blue to keep it festive. Stir in gel food coloring and transfer colored glaze to individual ziploc bags and snip off the very tip of the bag. 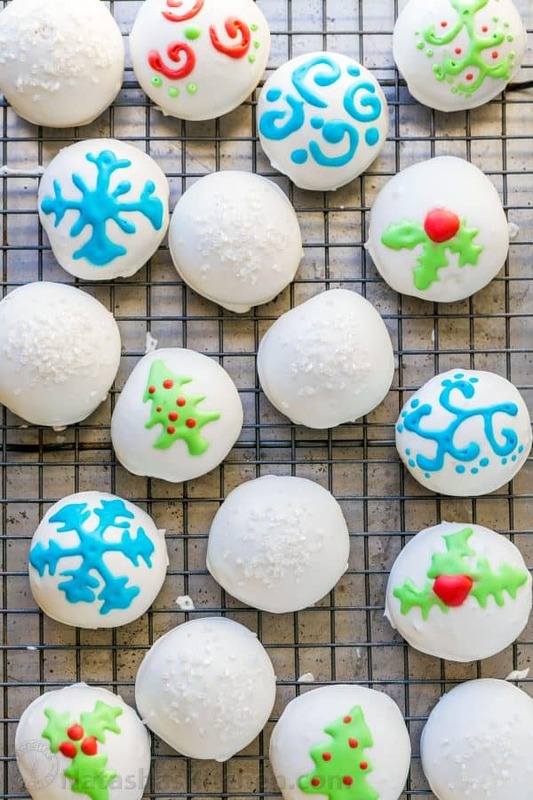 Once the glaze on the cookies is set, pipe on desired designs. 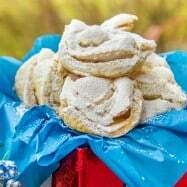 These make me want Christmas all year long! These glazed gingerbread cookies are easy to make and stay soft for days! 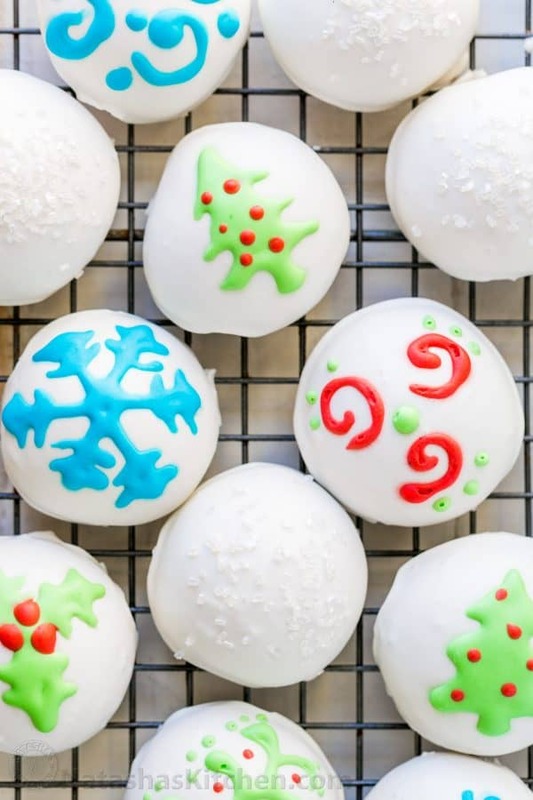 They have deep gingerbread cookie flavor and the glaze is perfect for decorating! 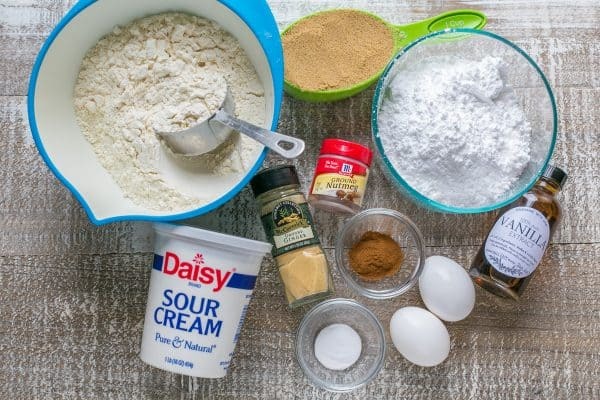 In a stand mixer, whisk 1 egg yolk and 1 cup brown sugar until blended then whisk in 1 cup sour cream. Put 1/2 tsp baking soda in a large spoon ramekin and stir in 1/2 tsp white vinegar. 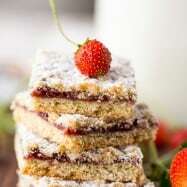 It will foam, then pour into the mixing bowl and stir into batter. Add 1/4 tsp salt, 1/2 tsp vanilla, 1 1/2 tsp ginger, 1 1/2 tsp cinnamon, and 1/4 tsp ground nutmeg, and whisk until well blended. Now using paddle attachment, add flour 1/2 cup at a time letting it incorporate before adding more. Dough will be very sticky. 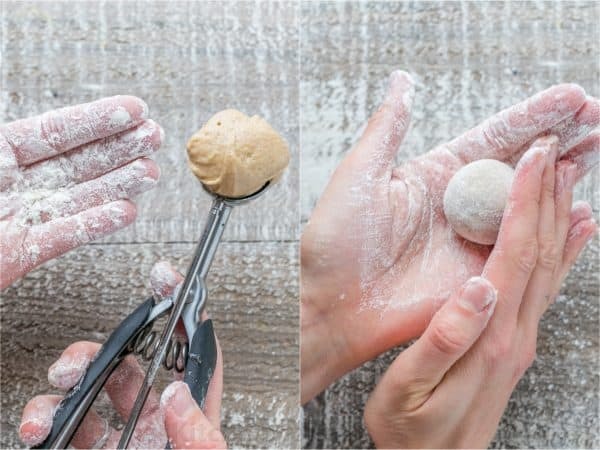 Scoop a rounded teaspoon of dough into well-floured hands and roll into 1” balls. 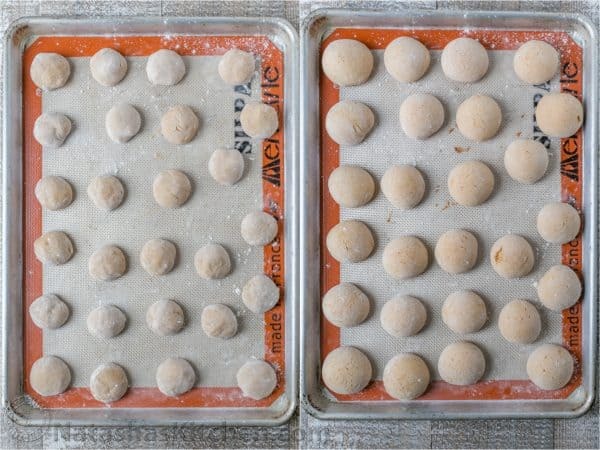 Space balls evenly on a silpat or parchment lined cookie sheet and bake at 350˚F for 20- 25 minutes (I baked for 22 min) or until barely golden. Remove immediately. 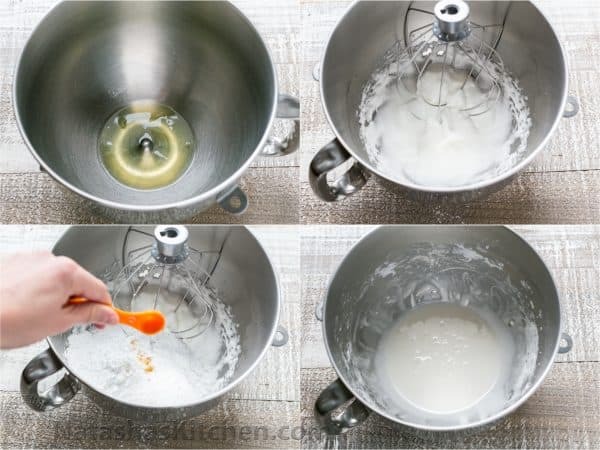 In the bowl of a mixer, beat egg whites on high speed with whisk attachment until foamy and tripled in volume (2-3 min). 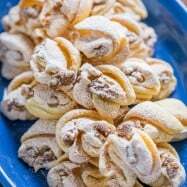 Reduce speed to low and add 2 cups powdered sugar and 1 tsp vanilla, mixing until well blended, scraping down the bowl as needed. 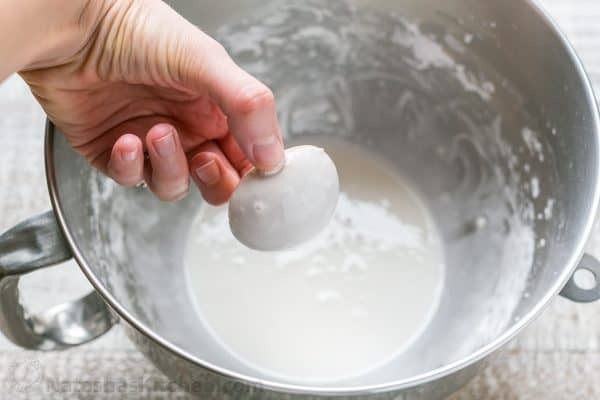 Increase speed to medium and beat another 2 minutes or until creamy and smooth (do not over-beat). 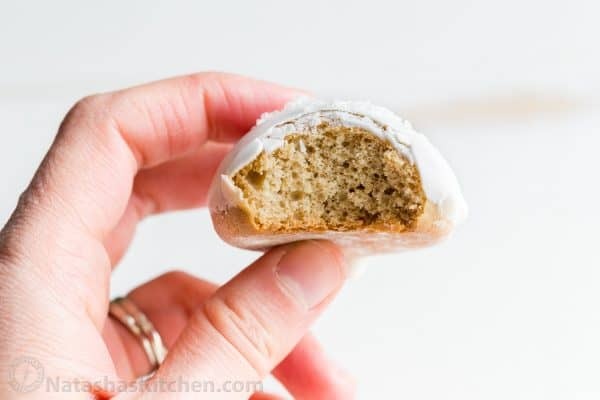 Once cookies are out of the oven and still warm, dip each one in the vanilla glaze, coating only the top of the cookie then set on a wire rack and let rest until glaze is dry. 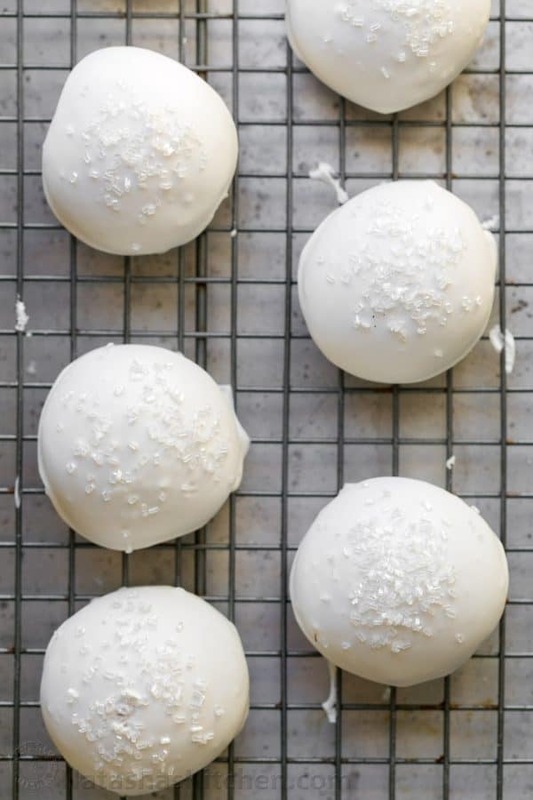 If you want to use crystal sugar or sprinkles, apply right after the glaze so the sprinkles stick to cookies. 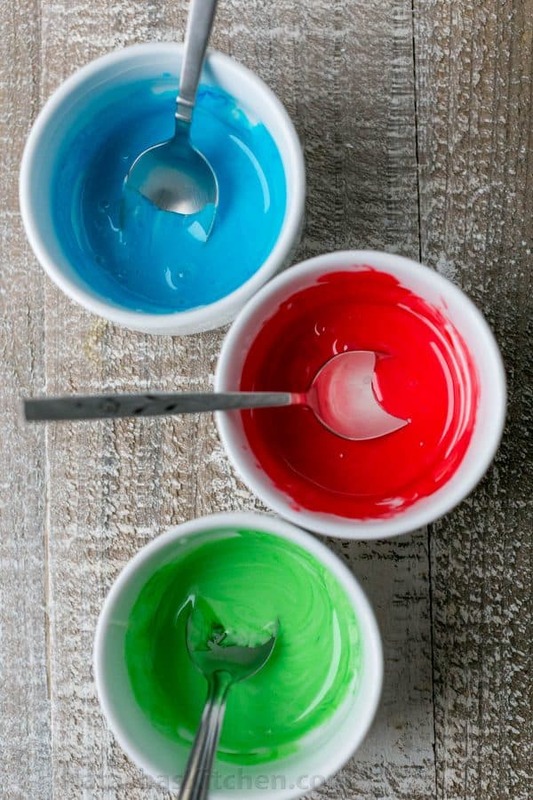 If using color, divide remaining glaze between ramekins and add desired colors. I used green, red and blue. Transfer colored glaze to individual ziploc bags and snip off the very tip of the bag. Once the glaze on the cookies is set, pipe on desired designs. 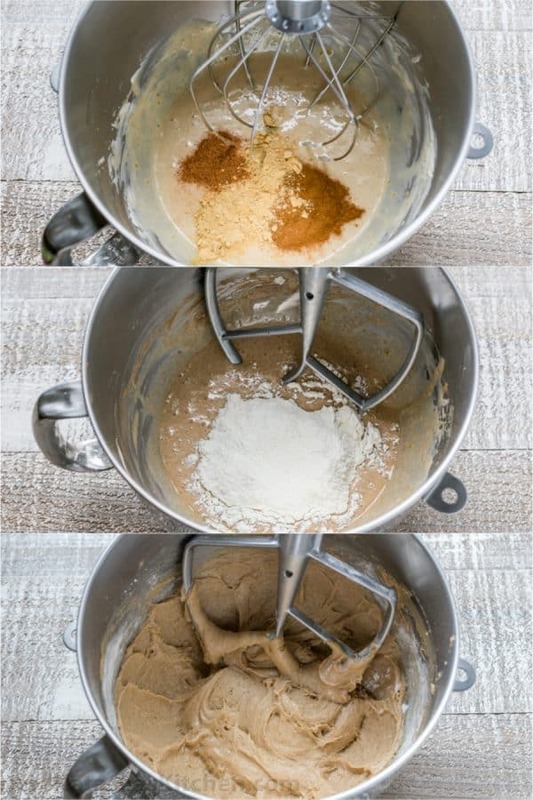 **To measure flour: stir to fluff it up, spoon into dry ingredients measuring cup and scrape off excess flour on top for a level, even measurement.